Politics: Florida Tax Money For A Bass Pro Everywhere We Go? Florida Tax Money For A Bass Pro Everywhere We Go? PALM BAY, Florida -- The Tampa Bay Times reported on Wednesday that the Hillsborough County commissioners approved a $6.25 million subsidy to lure Bass Pro Shops to Brandon, Florida. The Hillsborough county approval comes just a little over a month after Bass Pro Shops announced that it would be opening its 10th store in Palm Bay following tax incentives approved by Brevard County commissioners and Enterprise Florida. Despite the low-paying retail jobs that could displace nearby retail jobs, local officials around Florida often justified the use of tax incentives because a Bass Pro Shop in their respective local area would presumably serve as a destination spot to draw tourism dollars. 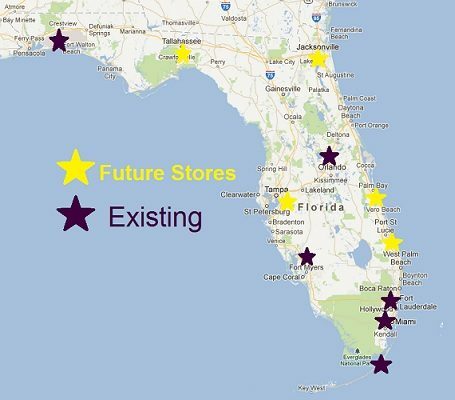 But as the map above shows, the planned proliferation of Bass Pro Shops across Florida significantly reduces the unique tourism draw envisioned by local economic developers. “We were all encouraged by the long awaited 9B / I-95 interchange being awarded this past August by the FDOT, said Cyndi Stevenson, St. Johns County Commissioner. “And now there could be no better example of the economic opportunities this major transportation improvement can bring to our State than this announcement by Bass Pro Shops." Port St. Lucie officials, having been politically shell-shocked after local governments provided more than $60 million total in land, buildings and other incentives to Digital Domain that later went bankrupt, did not not offer any incentives to bring Bass Pro to their community. "Absolutely not, this stands alone," Economic Development Council of St. Lucie County President Larry Pelton said to WPTV. "This stands on their business model and their expectations for the store, so no, there are no incentives being offered." Port St. Lucie Mayor JoAnn M. Faiella even tried to spark Bass Pro Shops' interest in the old Digital Domain building. However, Bass Pro Shops ultimately chose to locate in an empty Kohl's building near I-95. Bass Pro Shops' decision to go ahead with the Port St. Lucie location without taxpayer subsidies has caused officials in other areas of Florida to question the wisdom of handing out incentives. "I don't mind doing tax abatements," said Brevard County Commissioner Trudie Infantini at the February 5, 2013 commission meeting. "If you even look at Bass Pro, we gave them a tax abatement to get them here. I love Bass Pro, my whole family loves Bass Pro, so I am thrilled to have them. At the same time, Port St. Lucie got Bass Pro, they didn't give them any tax incentives. They just went to that community because its a good community where they can make money." "Maybe we should just start letting businesses succeed on the their own merits?" said Infantini to fellow commisioners. "It's just a thought for the Board to mull around."